The characteristics of a wine originate from the must that produced it. Its pre-fermentative analytical control is an essential requirement for obtaining a quality wine. Total acidity, pH, sugars and volatile acidity are just a few examples of analysis that allow precise analytical control of the must before and during alcoholic fermentation. However, in the case of harvesting in particular weather conditions, it is essential to be able to quickly and easily determine gluconic acid, YAN and L-malic acid in order to obtain a quality wine. Performing controls quickly and easily throughout the wine-making process is critical to obtaining a quality product. 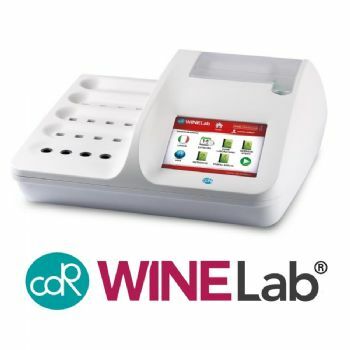 CDR WineLab® is a rapid analysis system that allows performing of the entire necessary quality control in the winery from the grapes to the finished wine. It's easy to use: Its extreme ease of use makes it useful for those who have no experience in laboratory techniques. The reagents are ready to use. The wine sample does not require any kind of preparation, while in the case of the must a short treatment to remove turbidity is all that is required. The analysis times are reduced, the methods are optimised and the results are provided in real time. The system does not require any maintenance or calibration. With just one tool it is possible to determine numerous parameters on the grape, on the must and wine. As such it is no longer necessary to acquire and learn how to use the many analytical tools.